For hospital patients on ventilators, a major concern to their long-term health is ventilator-associated pneumonia (VAP). VAP ranks as the most common infection developed by hospital patients in critical-care with between 9 to 24 percent of patients acquiring an infection when on a ventilator for longer than 48 hours. Patients who develop VAP average longer hospital stays, incur higher medical costs, and have a higher risk of death – 13 percent of patients who develop VAP during their hospital stay will die from the infection. A variety of factors can lead to hospital patients developing VAP, including microorganisms that grow inside the endotracheal tube and airway secretions that collect microbes that then travel past the cuff of the endotracheal tube. Now a recent study suggests that dental plaque – far from simply being a reason to visit family dentist in Eugene – may also play a role in the development of VAP. Researchers from Cardiff University in Wales found that the dental plaque of patients on respirators may undergo a type of change. For reasons not yet fully understood, dental plaque becomes colonized with bacteria and then acts as a catalyst for the development of VAP. In this study, researchers took samples of microbes from 12 adult patients on ventilators. The samples were taken from the biofilms of endotracheal tubes, from dental plaque, and from bronchial lavages. Researchers assessed the oral hygiene of each patient at the beginning of the study, and each received basic oral hygiene using an electric toothbrush while on the ventilator. The collected samples where then analyzed by the team. The most common type of bacteria discovered in the samples was Staphylococcus aureus, followed by Streptococcus pneumoniae, Pseudomonas aeruginosa, and Haemophilus influenza; each type of a common respiratory microbe. Surprisingly, when researchers analyzed the 20 most common bacterial species in each patient, they discovered that most of the microbes were present in all of the patients’ sample whether from dental plaque, bronchial lavages, or endotracheal tubes. This signifies a link between VAP and oral bacteria. Another important discovery was that the dental plaque of respiratory patients included bacteria not normally found the mouths of healthy patients but known to cause respiratory infections. Researchers don’t know exactly how the bacteria from the mouth might move downward to the lungs, but one hypothesis states that the organisms colonizing in dental plaque are directly aspirated in the lungs from the mouth. The harmful microbes may also develop inside the endotracheal tube and then get breathed into the lungs. The results of this study demonstrate the need for practicing quality oral hygiene among ventilated patients, especially for patients on a ventilator for an extended period of time. A patient’s risk for developing VAP increases over time, making a patient on a respirator for, say, 7 days more likely to develop VAP when compared to a patient who’s on a ventilator for 48 hours. According to researchers, an increase of evidence indicates that ventilators aren’t the only culprit in the development of pneumonia; poor oral health may be associated with community-acquired pneumonia in the non-hospital admitted population as well. In fact, a recent statement issued by the Infectious Diseases Society of America (IDSA) issued an updated statement this past October claiming that regular visits to the dentist may actually lower the risk of pneumonia because regular dental checkups eliminate bacteria from the mouth that could travel to the lungs and increase the risk of infection. 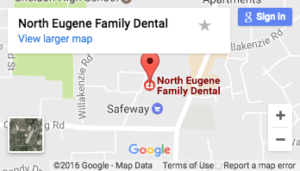 As your family dentist in Eugene has covered before in our blog, the connection between our oral and overall health is very real. We can longer simply think of our oral health as only relating to strong teeth and gums, but to a stronger body overall. By practicing quality oral hygiene at home – which the American Dental Association says includes brushing at least twice day for two minutes at a time and flossing daily – and scheduling regular visits with our team at North Eugene Family Dental, you can ensure that your entire body stays healthy now and into the future.